This post is very strictly against a very inappropriate thing which is even today also alive in India and that too also at a good level and i.e.. "Racism". We people say that we all Indians are united but I don't think that this thing is true as when I see that the one who cleans the roads or clean the surrounding are not even allowed to enter in the houses and when I see that the Untouchability is even followed today as the one who is working in the home as a servant is not allowed to drink the water from same bottle from which all other members of the house drink. WE ARE ACTUALLY UNITED AS 0 AND DIVIDED BY 0 BUT WE SHOULD BE THE VICE VERSE WHAT WE ACTUALLY ARE. Can any one please tell me a single appropriate reason for the practical existence of the racism is it really doing something good I found people talking about blacks and whites even in the country in which 90%+ people are black why the brands such as fair & lovely still in existence every one knows that the color tome is something very natural then why all this. Why people are even today following the practices of untouchability why people are talking about Hindus & Muslims separately why not Indians why people still talking about the upper casts and lower casts Why people from Bihar are treated as foreign people why they are tend to feel as foreigners in their own country.Why we all people are dividing India in so many parts. As we all know that it isn't a good practice and we all know why too but then also we follow it. 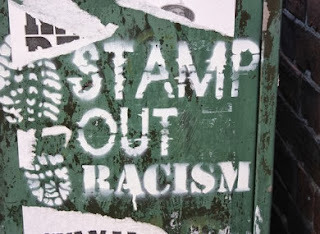 the most dangerous of racism is as simple and as dangerous i.e.. it is creating division in the hearts of people it is doing nothing more then that but that too is a very harmful as all the Indians would be knowing that the Divide & rule policy was the policy on which the Britishers had ruled India.By this we can imagine how dangerous is racism when it comes to the practical results. There is a very big need to remove racism from India. as the country will divide once again if such practices won't stop as the thing which Britishers had done in 1947 now we Indians are only following it once again.As we see sometime Hindus & Muslims are fighting with each other, sometime some states are fighting with each other, sometimes Gurjars are fighting for reservation the fights are endless. How can we remove racism from India. Try to stop any practice such as untouchability if you find it followed somewhere. Try to do something which unite people. Don't do something which shows hate for someone or any particular group. Don't do anything which creates a division and if you find then try to stop it.